This post is about the Al Jazeera journalists retrial earlier, its meaning and the media circus followed it. 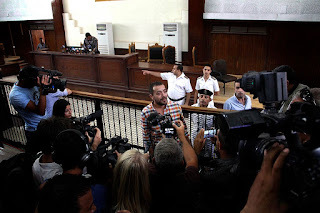 Earlier Saturday , a Cairo Criminal court sentenced six defendants including three journalists to three years in jail for broadcasting false news and working without a permit. The Al Jazeera international journalists Peter Greste , Mohamed Fadel and Baher Mohamed were convicted in the retrial of the famous controversial case. Students Sohip Saad , Shady Abdel Hamid and Khaled Abdel Raouf were also found guilty in the case and were sentenced for 3 years in the trial. Sohip Saad has already been referred to a military court last week for allegedly participating in a terrorist organization. TV producer Baher Mohamed was sentenced for additional 6 months in jail for possessing “illegal arms” aka an ammunition casing he brought from Libya during his work there covering the Libyan revolution. 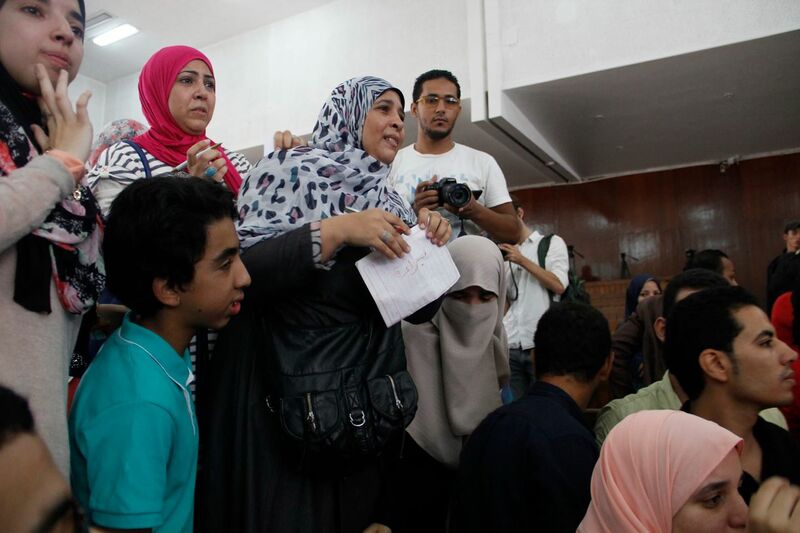 the start of the trial "Heba El-Kholy"
Baher Mohamed was celebrating his son Haroon’s birthday yesterday. Haroun was born last year when Mohamed was in detention. 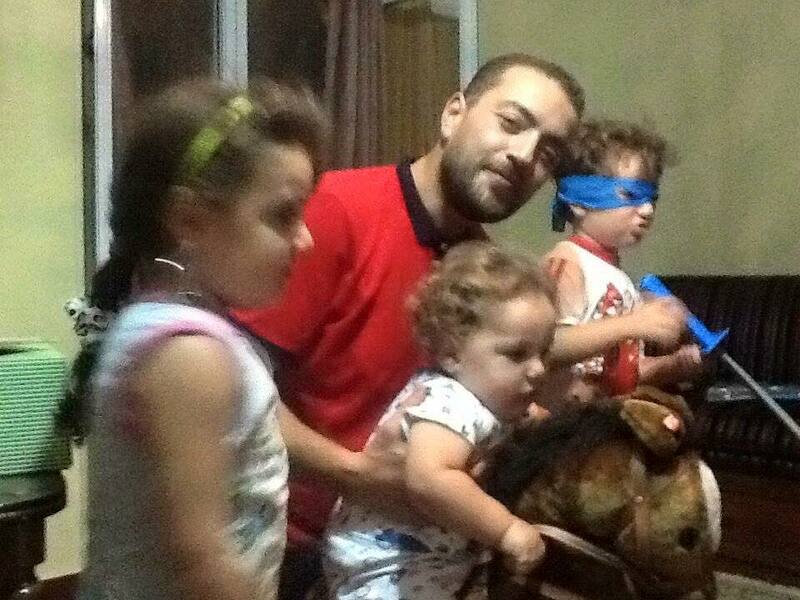 Baher with his children on Friday "Abdullah Shamy"
The court also acquitted two defendants Khaled Abdel Rahman and Noura Hassan ElBanna. The Mother of Khaled Abdel Rahman writes on paper "Acquitted"
so her son can read it at the sealed glass cage "Heba El-Kholy"
Peter Greste was sentenced in absentia as he was already deported in February 2015 to Australia according to the extradition law amended by President Abdel Fattah El-Sisi late last year. That law stipulates that the foreign convicted can be extradited to his country where he serves his jail term there. Australia did not sentence or jail Greste because he simply did not break any law there. Greste slammed online the verdict describing the conviction of the journalists in this trial including his as “politically motivated” vowing to use every diplomatic , legal, political and social tool to free the rest of Al Jazeera staff. Journalist Mohamed Fadel Fahmy’s lawyer Amal Clooney and the Canadian ambassador asked President El-Sisi to pardon the journalists because that what he promised before publicly and the deportation of Fadel Fahmy. The internationally renowned human right lawyer slammed today’s court verdict saying that it was sending a dangerous message about Egypt. “The verdict today sends a very dangerous message in Egypt“It sends a message that journalists can be locked up for simply doing their job, for telling the truth and reporting the news.”Defence lawyer Amal Clooney criticises the sentencing of three Al-Jazeera journalists in Egypt. the start of the trial "Kristen McTighe"
despite Egyptian authorities released him pending the trial with the rest of the defendants. The Egyptian authorities did not return back his Canadian Passport they confiscated in his arrest. 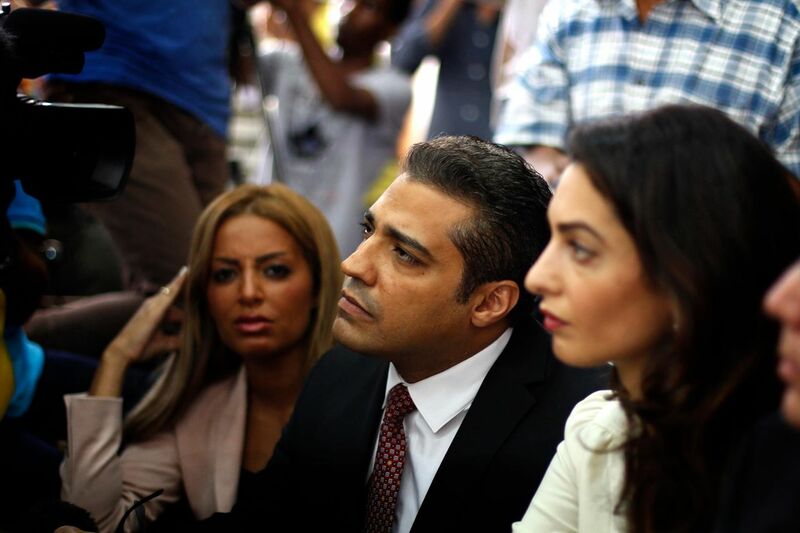 Since his release pending the retrial, Fahmy has been active in proving that he was deceived by Al Jazeera network. He started to sue the Qatari news network as well exposing the oppression against political dissidents in Qatar. He was always demanding freedom for other journalists and photojournalists currently in jail in Egypt like Shawkan. Personally I believe that Mohamed Fadel will be extradited to Canada eventually or he will be pardoned for his medical condition as he is suffering from Hepatitis C.
Baher , Fadel and Abdel Hamid have been transferred to Tora prison where they will serve their jail sentence according to Al Jazeera journalist Abdulla El-Shamy. To be honest I feel more angrier for Baher and the rest of the Egyptians in the trial because I know Fadel has got an exist out ticket and he could be free in return of some deal or diplomatic pressures as a Canadian citizen. Legally the court of cassation can accept another appeal for the case but it will take a time long according to my limited legally knowledge. Now thankfully the defendants were no longer accused of terrorism-related charges but they were accused of broadcasting false. Dangerously the Prosecution said that Baher and Fadel were not officially considered journalists because they were not members in Egypt’s Journalists syndicate !! Most of Egypt’s reporters and journalists are not members in the syndicate. They have to prove themselves to the court that they are officially journalists !! I think that this is not the first time courts and prosecution accuse journalists of that. Not to mention, TV reporters and producers are not members in the syndicate and for years they have been trying to unionize. The prosecutor also added in his word in front of the court that using Final Cut Pro to edit video was an evidence to falsifying the news because the raw material was edited !!!!!!!!! This is just madness !! Needless to say, there has been a media circus in the court earlier today revolving about Amal Clooney and her celebrity status. 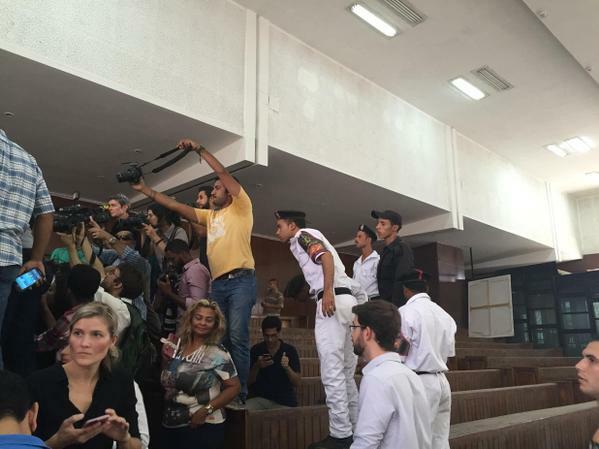 A true media circus "Independent"
I totally understand that she is the most famous international celebrity lawyer to enter that Court set up at the Low ranking Police officers Academy in New Cairo. I do not recall if international human rights lawyer and former U.S attorney general Ramsey Clark attended trials there but surely he is not that famous like Amal Clooney now and he did not attract cameras like that in court like that. On the other hand, I can not blame the photographers , after all she is more famous and attractive than Mubarak’s Kuwaiti defense team !! 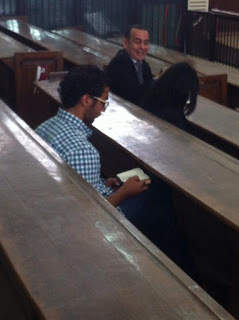 Speaking about Mubarak’s defense team , I have not seen today Mohamed Hammouda , Mubarak’s attorney who represents Mohamed Fadel Fahmy in court… thankfully. Seeing Hammouda and Clooney would be another surreal photo !! Since early morning , I have seen very few photos or even news about other defendants in the case whether those who have been found guilty or those who have acquitted let alone their photos and the photos of their families. All cameras were spotted on Amal to the level that we have not seen a photo for the defendants including her own client in the cage. Now moving to the Egyptian media coverage which was only focusing on her as being the wife of George Clooney that represents one of the convicted in the Al Jazeera journalists trial. The Pro-regime media covered the whole matter from a sexiest perspective as I expected. Youm 7 ran a whole report with pictures about how Amal Clooney’s big diamond ring captured the eyes of the people in the court !! I think it captured the eyes of the photographer only who did not think about his colleagues in the trial and thought about her diamond ring !! Pro-Regime CBC TV host Lamis El-Hadidy presented Amal Clooney as the wife of the most handsome actor in the world and not as the internationally prominent human rights lawyer before showing her interview with the British Lebanese lawyer. In a rare move , El-Hadidy criticized the court verdict. El-Hadidy already hosted Mohamed Fadel from short time ago in her show where he slammed and attacked Al-Jazeera and Qatar praising the 30 June revolution.. etc. Already ET Arabia was covering Amal Clooney’s statements to the reporters after the trial!!?? Why would ET be interested in covering her political statements to their viewers in Arabia who care only about singers and actors is beyond me !? Nevertheless, I would be lying if I said that I do not like that world/tabloid attention paid to the Al- Jazeera journalists trial now thanks to Amal Clooney. At least now many more people around the globe know what journalists in Egypt face and can face. Of course officially the world is slamming us over those verdicts. There is nothing new. Again journalism is not a crime.